Dr. Suess’ How the Grinch Stole Christmas (1966) is no Humbug! 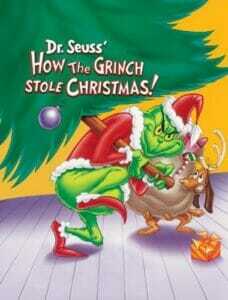 How the Grinch Stole Christmas is one of those holiday specials that has become a must watch for us each season. It wasn’t always that way, though. I know from reading up on the history of the film that it was released in 1966 just a few days after Walt Disney died. But, I don’t consciously recall ever watching it until maybe 1969. It must have been competing with something else my parents wanted to watch. But, after that it was pretty much a seasonal watch if we were at home since we moved in late 1969 and then had two televisions in the house. My sister and I would watch what we wanted on the old Black and White TV and my parents watched their “stuff” on the color TV. I watched all of the reruns of Star Trek on that television among other programs that were not on the family watch list. It wasn’t until after I met Ben and we acquired a DVD of it that we started watching How the Grinch Stole Christmas regularly. That tells you it was well into the late 1990’s even 2000’s before we got the DVD. Since that time it has become a favorite to watch for several reasons I will explain later. 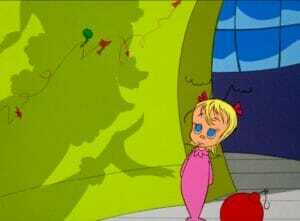 The who’s down in Who-Ville are a merry bunch and appear to be anathema to the Grinch and his not so well-being. He becomes so agitated by their merry making that he decides to steal everything that has a remote attachment to Christmas. He does this by dressing up in a Santa suit and puts an oversized antler on his dog Max. Down the mountain they fly on a giant sleigh down into Who-Ville to do his E-Vil. He packs up all of their decorations, presents, and food. The only thing left is the hooks and wires that held up the decorations, he even steals the crumb to small for a mouse. 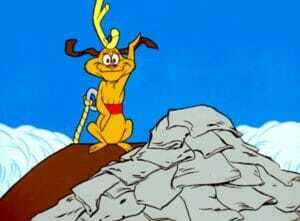 As max attempts to get the sleigh back up the mountain they reach a sheer cliff where they are perched on the precipice and the Grinch hears the Who’s singing their Christmas song. It appears Christmas has come despite his attempts to steal it. It is at this point he discovers the true meaning of Christmas and rides back down into Who-Ville to be apart of the feast where he carves the Roast Beast. It is a fun story told in typical Dr. Seuss style but some of the more interesting items are in the history of the making of the film. And that is why it has become a favorite. First, there is the narrator who is none other than Boris Karloff, famed horror actor but in real life a very kind and generous man. 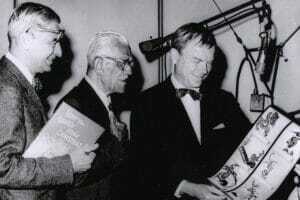 Chuck Jones was the Director and Producer on the film and wanted Boris Karloff as the narrator. 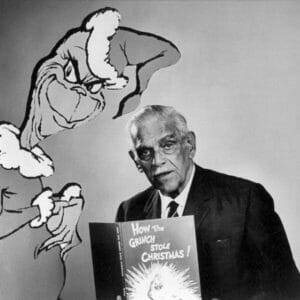 Dr. Seuss (Theodore Geisel) didn’t originally want Karloff as he thought it might be too scary and later changed his mind. 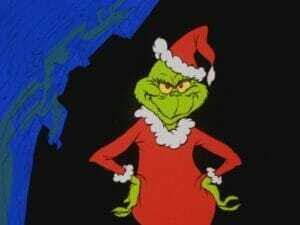 Second is the Disney connection with Thurl Ravenscroft singing ,“you’re a mean one Mr. Grinch. Thurl was best known as Tony the Tiger for Frosted Flakes cereal but was also a staple in many Disney recordings most notably as the sideways singing head in the Haunted Mansion. Dr. Seuss noticed after the film was completed that his name had been omitted from the credits and promptly wrote letters to several critics and newspapers asking them to give credit. And finally, the book, from which the TV special was created was only 32 lines. 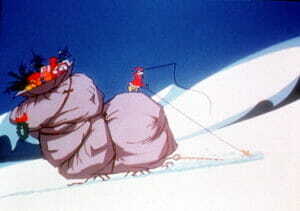 Dr. Seuss created the songs in the film to fill out some of the time and Chuck Jones filled time with a number of action only sequences with the descent into Who-Ville being the longest. You can here sounds used in the Road Runner cartoon being used for the sleigh. Even with all of that the piece only manages to be 26 minutes. It should also be mentioned that the budget for this piece was more than four times what A Charlie Brown Christmas was produced for the year before. It is definitely worthy of a watch each holiday season for not only the history of the piece but the sentiment expressed. And you can own it for your very own on DVD and Blu-ray. It is just fun.